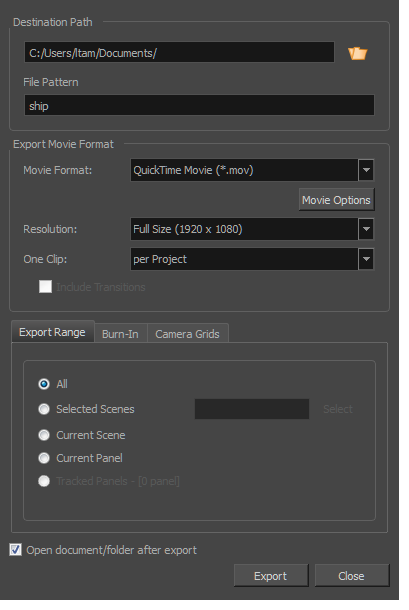 The Flash Export Settings dialog box lets you compress and set the video quality of the movie you are exporting. The Export to Movie window opens. In the Destination Path section, click the Browse button and choose a folder in which to save your movie. ‣ From the Movie Format menu, select Flash (*.swf). ‣ Select the Resolution from the drop-down menu. This will be a quarter size, half size, or full size of the current storyboard resolution. The Flash Export Settings dialog box opens. Protects the movie from being imported into another application. Compresses movie into a lighter format. The movie may lose some quality, but in turn create a lighter file. Lets you set the quality of the video image. 100 = Full quality, 50 = Average quality at about 1/5th of the size, 25 = Medium quality, loss of high image resolution starts to occur, 10 = Low quality, “macro-blocking” or large pixelation become obvious, 1 = Lowest quality, extreme loss of colour and detail, the image becomes virtually unrecognizable.